The most fundamental visual element of a brand identity is its brandmark or logo. 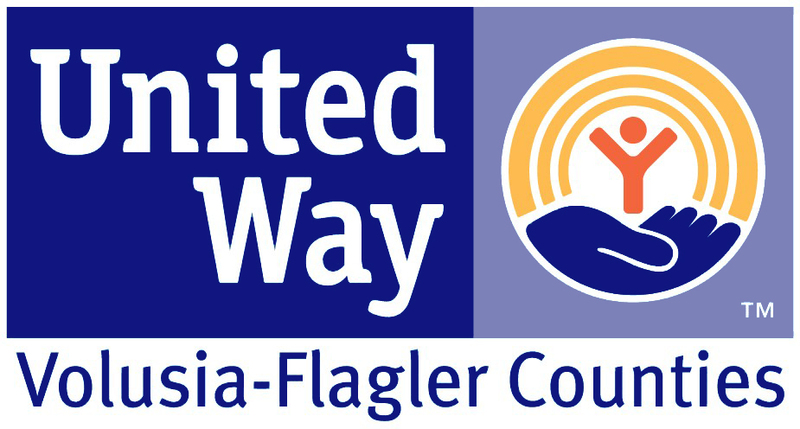 The United Way of Volusia-Flagler Counties' logo is a sign of a new approach for the future - an approach based on a firm foundation and proud past. The proper use of the images, logos and brandmarks of the United Way of Volusia-Flagler Counties must be in compliance with all local, state and national requirements of the United Way of America. If you have any questions, please contact Crystal Elkins, Director of Marketing and Events. The full color version of the United Way of Volusia-Flagler Counties brandmark is the primary brandmark of the identity system. It is strongly recommended that this version be used in all applications whenever possible. These colors are the primary United Way colors and should be the only colors that are used when possible. Note: As one of our most important assets, the brandmark must always appear as shown on this page or in one of the color variations described in these guidelines. Never attempt to redraw or rescale the brandmark or add other graphic elements. The trademark symbol (TM) must be used with the brandmark to ensure United Way of Volusia-Flagler Counties' legal rights are protected. Always display the trademark symbol (TM) in the position indicated. Background colors and graphics can easily overpower or compete with brandmarks. A white outline has been built into the artwork to maintain separation between the United Way brandmark and the backgrounds where it will appear. This outline will not appear when the brandmark is staged on a white background and different color binding-boxes should not be used. Additionally, the box size should not be altered in any form. The special usage United Way brandmarks are used when printing on colored surfaces, or screening of inks is not possible. This may occur when reproducing on plastic, glass, metal, fabric or other materials used for merchandise or signage. For printed materials, these brandmarks may only be used when the method of reproduction is faxing and photocopying or the surface of the paper is a color other than white. For example, this may occur when printing a black & white laser print on blue paper. When printing on white paper, the full-color or one-color brandmarks should be used at all times. These brandmarks should never appear on a website, four-color brochure, one-color brochure or any other application where a full-color or one-color brandmark is useable. The special usage brandmarks may not be reproduced in any color other than United Way Blue (PMS 287), black and white. The consistent and correct application of the United Way of Tampa Bay brandmark is essential. Always follow the standards presented in these guidelines. The examples here illustrate some unacceptable uses of the brandmark. Never attempt to redraw or rescale the elements of the brandmark or add other graphic elements to its presentation. Make sure you are using the correct version of the logo. The old "rainbow hand" was retired years ago and should not be used. Make sure that the United Way logo is always on the right hand side and on the bottom when listed with other logos. Three standardized typefaces have been chosen for the United Way brand identity. They are to be used in all printed and online communications. Each of the fonts was selected for its visual compatibility with the United Way brandmark and for its ability to convey a personality that is consistent with our brand. Only use the weights and styles shown on this page. NEW with the launch of the LIVE UNITEDTM campaign, Trade Gothic Condensed has been added as a headline font. It should be used sparingly in marketing communications to draw attention to important text. The primary typeface in the United Way brand identity system is Meta. Meta is a simple and clean typeface that conveys a humanistic and caring, yet professional tone. Arial is an acceptable substitute for Meta only when Meta is unavailable. Arial can also be used in correspondence, in word-processed documents, for text in publications, for PowerPoint presentations and for narrative text on websites. Times New Roman is a classic serif font that may be used in correspondence, in word-processed documents or for text in publications, but should not be used in headlines or subheads. For a complete instructions on branding guidelines, please contact Crystal Elkins for a copy of the complete branding guidelines.